During winter, dry and cracked lips is I guess the issue for everyone. In my case its quite severe and I constantly need to moisturize them with lip balms or lip oils. Few days ago, I got a chance to explore the new arrivals in a mall. I found essence lip balm range. I found them interesting as it claims to be used as a balm and gloss at a same time. It consists of 6 different colors and fragrance (which I love to call flavors). Starting from the left: Strawberry cheesecake, Apple Pie, Cherry Brownie, Mint drop, Mango Ice-cream, Berry Cupcake. I tried all of them on my skin to pick up the most suitable shade. 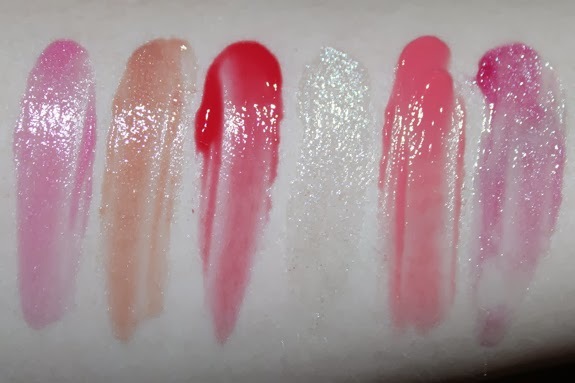 Strawberry cheesecake, apple pie, mint drop and berry cupcake have a little bit of shimmer in it. All of them were cool but I preferred Strawberry cheese cake and mango ice-cream as they have a bit of more pigmentation. It's available in a squeezing tube. Packing is cute but looks cheap at the same time. The tube is very small so its easy to carry with. 8ml tube is available in $1.5 or PKR 160/-, which is quite reasonable one. Packing is good and the size is perfect to carry with. When it comes to price its quite cheap but the quality is slight low. As a balm I loved it, but as a gloss its below average as it has less pigmentation.